When it comes to laser hair removal, not everyone knows everything, however people usually everything that they read or hear. But, unless it is coming from a reliable source, you must not believe everything that you read or hear. It is important to verify the source. To help you clarify your doubts about laser hair removal, here we are listing 5 things that will change what you think about laser removal. Back when laser hair removal first started out, the treatment was really costly. Getting a small area treated used to cost thousands of dollars. Now that laser hair removal is more common, the price is a lot reasonable. This for sure depends on where you are going for the treatment and the size of the treated area. Like getting both your legs treated will be a lot costlier than doing your underarms. As laser hair removal is permanent after a particular number of appointments, the price can be completely worth it if it is within your budget. You must be aware of the painful experience of the waxing. No matter how good your waxing lady is, it hurts. Laser hair removal, on the other hand, is not necessarily enjoyable, but it is a lot less painful than waxing. It only hurts half as waxing. The machine or laser used for laser hair removal uses the wavelength of light to detect and zap hair follicles. The procedure feels like tiny pin pricks on your skin. So, the amount of pain is small to moderate. Yes, it is true. Laser hair treatments are a quick, get-in-get-out type of appointment. Who doesn’t love those? Now, this is when you are getting a smaller area treated- a full leg appointment will take longer. You have to visit regularly for 4-6 weeks, for permanent results. The laser technicians will give you complete details about the laser hair removal on your first appointment. This is true that results of laser hair removal differ from person to person. If you have dark, thick hair and light skin, you are just the right candidate because the laser can easily detect the hair follicle. The closer your hair color is to your skin color, the difficult it will be for the treatment to be effective. However, the advanced lasers are known to be effective on dark skin and blonde hair as well. 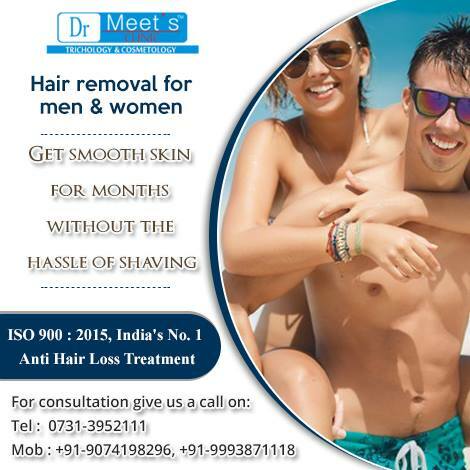 To know more about laser hair removal, contact Dr. Meet’s Clinic today. You can easily make an appointment online. Regardless of the constant increase in popularity of laser hair removal, there are many myths surrounding the procedure that still prevent a huge number of people from opting for laser treatment. 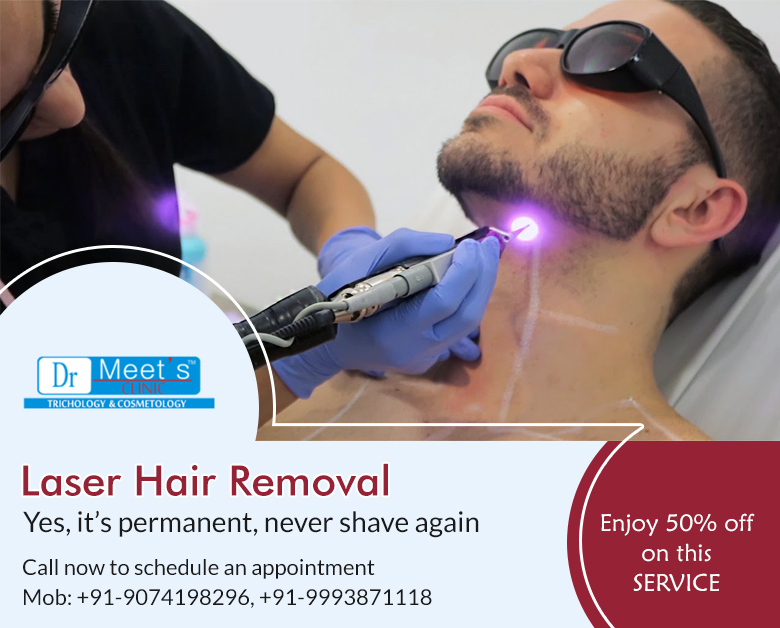 If you are also confused whether you should go for laser hair removal or not, only because you have heard it is not safe or it is a very costly procedure, continue reading and you might change your mind about laser treatment. Fact: This is not true. The results of laser hair removal differ from person to person depending on the skin color and the texture, type and color of the hair you want to get rid of. Coarse and thick dark hairs are best treated with laser. On the other hand, light colored hairs respond the least to laser beams. Fact: Lasers can be used in almost any part of the body, from back to the arm, face to chest and bikini area to legs. Most commonly treated facial areas include upper lips and chin. 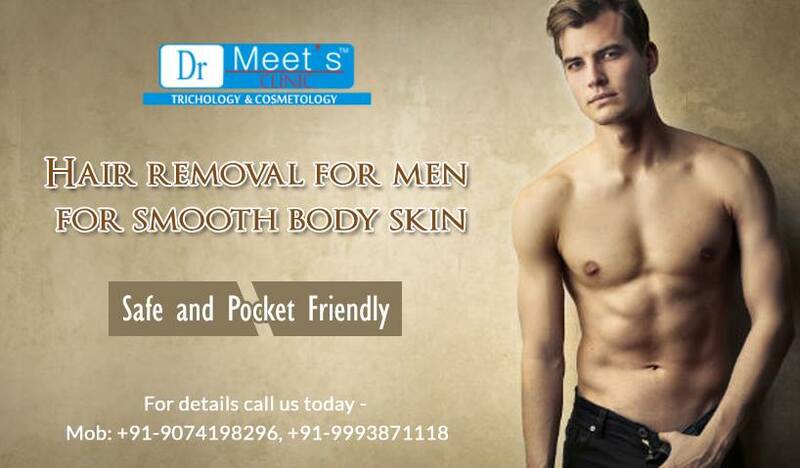 On the body, you can effectively use lasers to remove unwanted hair from thighs, abdomen, back, chest, legs, arms, feet, hands and neck. Underarms and bikini area are also most commonly treated areas. Only it is not recommended for treatments around the eyes. Fact: Initially lasers were not recommended for people with darker skin, as they were at risk of skin burns. But now technology has become more advanced, as a result, we have lasers that work really well on people with dark skin and light hair. So, there are no limitations in laser hair removal anymore. Fact: In general, patients experience mild to moderate pain and discomfort, but one can easily bear the pain. Some patients also experience burning sensation but again it is also very mild and not out of patients’ pain bearing capacity. Most people compare these sensations with snapping of a rubber band on the skin. If you get waxing or tweezing performed, you will find laser hair removal almost painless. Topical anesthesia is also used in case of patients who have low pain threshold. Fact: It is nothing more than hoop-la. The laser beam can’t move beyond a set limit. The laser used for the procedure can penetrate only up to a quarter mm into your skin, then reach the internal organs is just impossible. Laser hair removal is a very safe procedure that has been approved by the FDA.